Originally published as “Mill on the Loss” in the Indian Express Mumbai Newsline, 5 April 2000. The history of Mumbai is a narrative of the struggle over space. The fate of the mill lands of central Mumbai, and its industries and workers, is the latest chapter in this story. The life of any city is not simply tied to its flows of goods, services and capital, but also to its patterns of work, leisure and movement — all of which revolve on the use of space. Throughout Mumbai’s history, claims on land and space have been the narrative thread of the most celebrated and most notorious chapters in our urban history. These range from the legendary reclamations that linked up several marshy outposts and settlements to compose the island city in the eighteenth century, to the disastrous Back Bay Reclamation Scheme in the 1920s. This scheme to fill in the Back Bay earned the name “Lloyd’s Folly”, after the bungling of the then Governor, whose plan ended in failure and infamy because of engineering mistakes, corruption, and the crash in land values during the Great Depression. The story of the Mumbai Mill Lands is a fin-de-siecle echo of this familiar urban theme. The historic textile mills of the city are industrial dinosaurs dotted around the city landscape, whose textile production has been eclipsed in efficiency and profitability by the sweatshop labour employed in powerlooms towns like Bhiwandi. The millowners realised long ago that the lands of the city mill compounds are more valuable than the textiles they produce, and the workers whose livelihoods they have sustained for several generations. 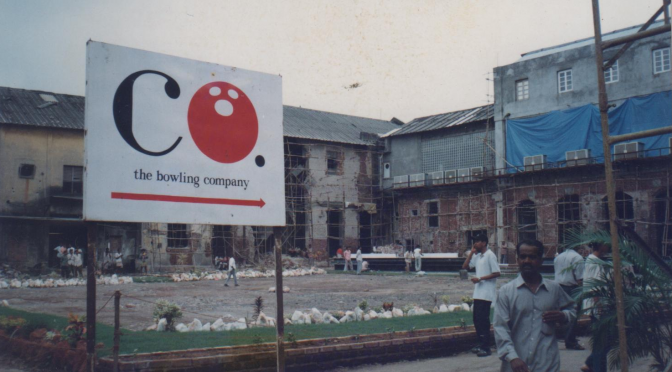 This long essay is a study of the closure and redevelopment of the Phoenix Mills in Lower Parel, Mumbai, conducted from September 1999 to March 2000. Click here to download the original booklet (PDF) published by the Girni Kamgar Sangharsh Samiti (GKSS), Girangaon Bachao Andolan and Lokshahi Hakk Sanghatana in April 2000 in Mumbai. Since the tragedies at Elphinstone and Kamala Mills in 2017, the full text and booklet is re-published below with minor revisions and colour photography from 1998-99.